Farro is one of my favorite grains to eat. I love its nuttiness and chewiness. I find it's a grain that's easy for so many to love because it's not quite so chewy and hard - like wheat berries (which I personally also love), for instance. Its firm yet still familiar texture makes it a great component/accompaniment to salads, soups, stews, and so many other dishes. I like mixing up our default brown rice with farro for dinner and making it a focal point of the meal by making farro risotto, too. It's pretty easy to add farro (and other whole grains you enjoy) into your meals. I especially love grain salads, particularly in the summertime when seasonal vegetables are plentiful (though roasted root vegetables are always nice, too). I'm always happy to check out farro recipes and I really liked one I saw from Cooking Light last December. I adapted the recipe some but the main idea was having roasted grape or cherry tomatoes as a basis for the dish. I love to roast grape tomatoes. I typically roast a big batch of them with garlic to toss with pasta but why not do something a little different and mix it up with some farro instead. And boy, this is one of those so-simple yet so-tasty little dishes. I'm thinking it's a great side for summer barbecues but whenever I make something like this, I want to make a whole meal out of it all on its own because it's just so tasty. I played around with the recipe a little but it starts with roasting some grape or cherry (I used grape) tomatoes with garlic until they're just soft and somewhat crinkly, not so far that they are totally broken down into a sauce. You want to soften and draw out the sweet-tart flavor of the tomatoes while keeping much of the structure intact. I wanted to add a little more substance and color to the dish so I added edamame. It's one of those things I always have in the freezer because it bulks up so many dishes so well. Here, it adds color and a complimentary texture to the farro. It also couldn't be easier to include since I just plop them for a few minutes in the boiling water that I then used to cook the farro in. Speaking of the farro, I use Trader Joe's quick-cooking farro, which cooks in about 10-12 minutes. It's another must for my pantry. Whatever you use, keep an eye on it and cook the farro until it just begins to bloom - avoid overcooking it so you're sure to get a nice chewy bite from the nutty grain. To bring all the components together - the roasted grape tomatoes, the farro and edamame - is a little sherry vinegar, along with salt and pepper. A small handful of chopped toasted walnuts finishes it off. Please don't skip the walnuts, and do toast the nuts first! The walnuts bring out the grain's nutty chewiness so well and toasting the nuts is an effort that produces a huge payoff in flavor. I'd be happy to have this in my refrigerator every day! If you want to check out the original recipe, you'll see that the tomatoes are roasted with not only garlic but honey as well. I actually really enjoy the tartness of tomatoes so I opted to skip the honey but I don't doubt that it would be quite tasty with it. When I usually roast grape or cherry tomatoes, I slice them in half lengthwise and toss them, along with a few cloves of crushed garlic, in olive oil and seasoning before roasting at a high temperature so they break way down and I have a great sauce to toss with some pasta. While the tomatoes are cooling, bring some water to a boil. First, cook the frozen edamame in the boiling water for a few minutes and remove it. Add farro, cook until done, then drain (I don't rinse it). To finish, toss the farro with the roasted tomatoes, edamame, as well as a few splashes of sherry vinegar. I always reach for red wine vinegar and I now really appreciate how good sherry vinegar is as another option. It's a bit like balsamic but less sweet, and it's great with tomatoes. Season everything with salt & pepper, taste to adjust, and finish with a sprinkle of toasted walnuts. If you like a little cheese for added creaminess and richness, the recipe recommends feta. And if you want more sweetness, I think some corn would be a good way to go. I've already made this twice in less than two weeks. I like that you can eat it at room temperature and that leftovers keep well in the fridge. Any time I grab leftover grain salads like this one from the fridge, I like to bring it to room temperature or warm it up a bit and then add a little extra sherry vinegar (or whatever the acid may be) to brighten it up. Update (June 2015): I've been taking this basic garlic-roasted tomato idea and running with it, eating it plain with some fresh basil and tossing it in with other grains. I find that grape tomatoes are easy to get a hold off and usually in good shape throughout the year so it's easy to buy a container and roast them this way. I love making grain salads and lunching on it for a few days; for variety, I rotate the grain I use (whether it be quinoa, farro, wheat berries, or bulgur as in this case below) and add sautéed or roasted vegetables, using up what I have on hand. I've been doing just that lately, adding these garlic-roasted tomatoes into the mix. I finish it all off by simply stirring in a few splashes of red wine or sherry vinegar as well as salt and pepper. It's nutritious and delicious! Toss garlic-roasted tomatoes and vegetables for a simple grain salad. This is bulgur wheat with sautéed onions, corn, and asparagus, with the garlic-roasted tomatoes. In a bowl, toss the tomatoes with olive oil and garlic, and season with a bit of salt and pepper. Transfer the tomatoes to a small baking sheet, placing the tomatoes cut-side down. Gather the tomatoes close together, in one layer, so that they're touching. This helps prevent browning. Bake until tomatoes are wrinkled and soft but not mushy, about 20 to 25 minutes (grape tomatoes may take less time than cherry tomatoes). Remove from the oven and let cool to room temperature. While tomatoes are cooking, cook farro by bringing a pot of water to a boil. Add frozen edamame and cook for 3-5 minutes, then remove to a bowl. Add farro and cook for 10-12 minutes until chewy, then drain (if you're not using Trader Joe's quick-cooking farro and cooking your farro differently, cook as directed and you can add frozen edamame to the last few minutes of cooking before draining). In a large bowl, combine farro, tomatoes, and sherry vinegar. Season lightly with salt and pepper. Toss gently together. Taste, and adjust seasoning as necessary. Top with toasted walnuts. Serve at room temperature or store in the refrigerator until needed. If cold, I like to bring it to room temperature and add a splash of sherry vinegar before serving to brighten it up. A fantastic salad, Monica. Those garlic roasted grape tomatoes sound utterly delicious and fresh. I too love farro (it's called emmer over here), but I can only find the whole grain, which takes much longer to cook. It is so delicious and I love all kinds of grain salads. This quick-cooking farro is certainly a huge timesaver. Hope you're having a great weekend! I love how hearty and fresh this salad is, Monica! The garlic roasted tomatoes look perfect and it sounds fantastic with the farro and edamame! So full of color, simple, flavorful and delicious! My favorite kind of meal! <3 this! This dish looks so vibrant and fresh...love it! Thanks, Jenny. The tomatoes are a nice pop of flavor. I have this thing of adding lentils to salad but I have to admit I am a bit bored with it now. This is a timely post! I can't wait to replace with farro. Great idea for a wholesome, healthy, delicious and amazing looking lunch. What a lovely and nutritious salad! Such pretty colors! Farro is my favorite as well!! I love what you've done with this CL recipe...I've done my own play on it also with asparagus and feta, but the edamame addition is something I need to try! I could have that in my fridge everyday too - love roasted tomatoes - the colors, textures, and the healthy aspect of this dish is all wonderful! Well color me happy, this is a perfect meal in my heart! I love edamame so much but sometimes I find it's hard to come up with recipes that use them (besides stir fry) so I love seeing this recipe here! Last year we had a big soybean harvest so I'll be getting some out of the freezer to use for this dish! I wish I had your "problem". : ) There are some must-have's for my freezer and edamame is one of them. It is great for a grain salad. Enjoy all your harvest this year! This sounds so good, would make a great dinner then the rest for lunch the next day! That's usually my plan, exactly. Thanks! Farro is not a grain I see too often in Hong Kong. However, if I ever do I will certainly be making this delicious dish. I just love roasted tomatoes and really this salad would be lovely with any grain. We have those really sweet and delicious grape tomatoes from Malaysia and I just those. I like "beefing" up all salads by tossing in some kind of grains or lentils and then adding some nuts and maybe some hardboiled eggs. It makes a nice filling meal. Roasted tomatoes are always so good tossed in anything and those grape tomatoes you mentioned sound delicious. Yummy! 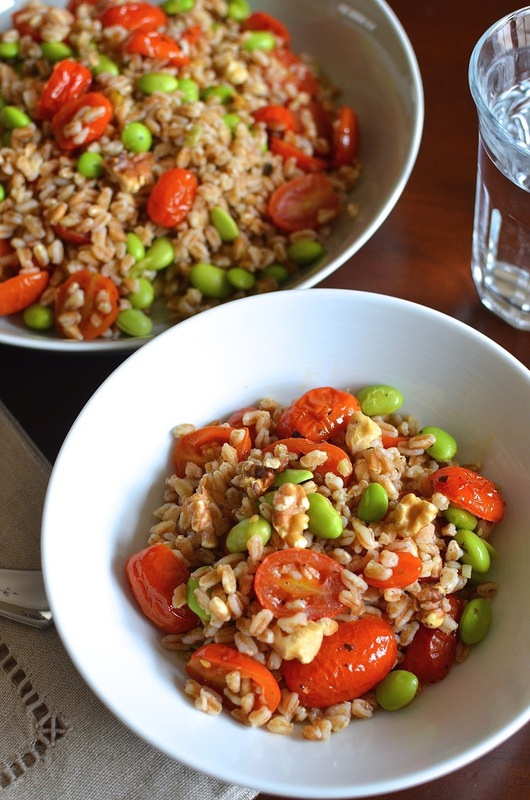 I've never had farro before actually, but it sounds delicious in combination with edamame and tomatoes! I love farro's nuttiness too and this is such a great way to serve it! Those roasted tomatoes sound amazing! Glad you like it, too, Christin. I usually roast tomatoes til all the juices run out and it makes such a great pasta sauce but this is a different way of having it and it's a nice way to have it with grains. I just discovered farrow recently when I bought a bad from Costco...and yes, we love it, like you said, chewy and nutty...and I love your recipe with the roasted tomatoes and walnut...great textures going on in this dish...thanks for the inspiration Monica! Same here! Love tomatoes for that sweet-tartness. Thank goodness it's spring (finally) and summer will bring even more color and fresh produce. Yay! Farro is one of my favorite grains, too! Can't wait to try this one! Monica, I'm with you - I'm a farro fan. I love the nutty, chewy texture and it makes such a nice addition to this dish. And I also love roasted tomatoes, so you've totally sold me on this dish! The walnuts round it all out, Kristi...hope you give it a try! Thanks! Oh my word! This salad looks like something I have to try!!! Hi Monica, thanks for introducing me to farro, will definitely have to try finding it! This dish looks amazing, roasting tomatoes really heightened their sweetness, love it! Farro is like big brown rice. : ) Hope you give it a try and thanks! I haven't tried farro before. This salad looks real good, especially with those sweet roasted tomatoes. I will try this soon! I gotta make this when Bryan is not around. He is not a fan of wheat grains like this. I love using farro too Monica. That a pretty beautiful, healthy salad. The roasted garlic tomatoes are perfection. So nutritious are perfectly balanced meal. I'd be happy to have this in my refrigerator anytime girl. Great one.